In previous posts, we discussed preservation practices regarding some of the incredibly unique items that are part of this accrual. 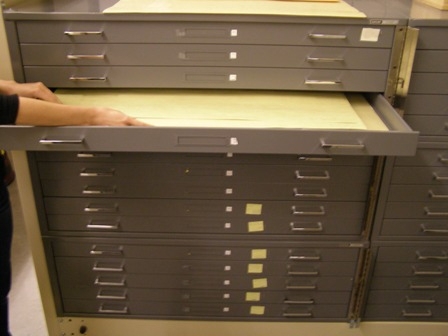 To switch things up a bit, we thought we would take you on a little tour of our oh-so-ordinary storage practices which help ensure the long term preservation of archival material. The most common type of storage is the record storage box. 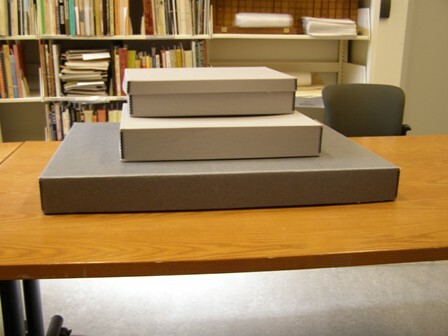 Typically, these boxes are used to store paper records (go figure!). In the case of the Douglas Coupland fonds, we also occasionally house other items in these boxes – such as the small canvases shown below. 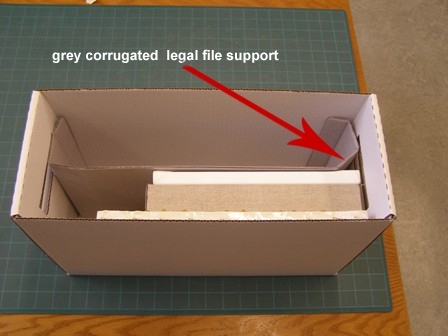 Note the file support that ensures the items don’t slip and slide around inside the box. Items should never be placed in boxes that are too small or too large. You don’t want the material to be squashed or knocked about. If material doesn’t fit in any of the standard sized storage containers, custom boxes can be ordered to fit the exact dimensions of the items. 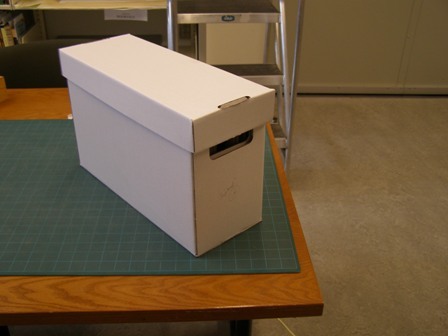 Custom boxes not only ensure that we safely and properly enclose items, but also allow us to maximize space in the vault — a hot commodity in archives! Some items need to be stored flat. In this fonds, we have large photographs and poster boards that would warp if stored vertically. Map cabinets are the perfect solution for these items. I bet you had no idea we put so much thought into something as simple as a box! In our last post, we talked about how we approached processing a bejeweled hornet’s nest. As it turns out, this wasn’t the only unusual or unique item that required extra thought in terms of preservation and special storage. 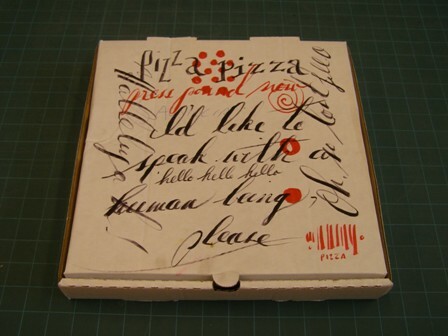 This old pizza box with calligraphy (complete with grease stains, encrusted cheese, and lingering pizza odor) needed to be cleaned before being permanently housed as part of the fonds. In this case, the stuck-on food particles were of particular concern. As a general rule, no food or beverages are allowed inside RBSC. Not only could spilled coffee or ketchup stain or permanently damage the materials, but lingering crumbs could attract certain, ahem…undesirable patrons—namely critters like cockroaches or, heaven forbid, rodents. So what did we do with the crusty pizza box, you ask? 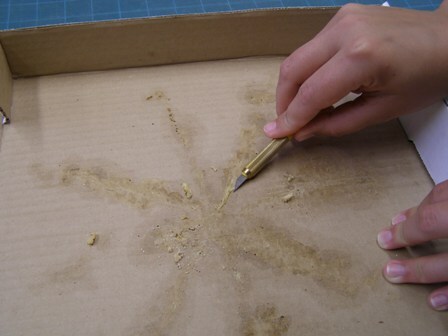 We began by isolating the pizza box so that it wouldn’t contaminate any of the other materials. A separation sheet marks the pizza box’s original location in relation to the other materials and directs future users to its new “home”—a special archival quality box that it gets all to itself. The next step was to do some surface cleaning to remove the crumbs, cheese bits, and as much of the grease stain as possible. We began by gently scraping off bits of cheese and crumbs with a scalpel. We took great care to not damage the box and to fully isolate and dispose of the rogue crumbs in the nearest rubbish receptacle. Our next step was to give the box a thorough cleaning with a chemical sponge. These sponges were originally designed to remove soot and grease caused by fire damage, but they work wonders on dirty archival documents. 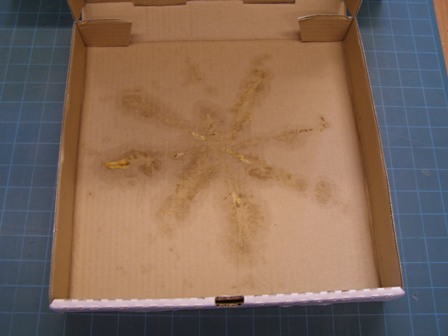 The stain is still visible on the Coupland pizza box, but the process did remove some of the excess grease. 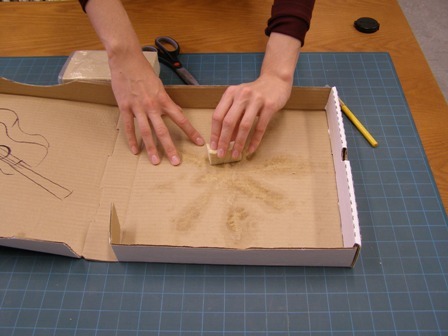 Before being stored in its archival box, the pizza box was sealed inside a large Ziploc bag to lock in any remaining odor or microscopic food particles that might attract pests. Finally, this item, like all special collections materials, will be stored inside RBSC’s environmentally storage areas. This item and most other paper-based archival material will live in the Automated Storage and Retrieval System (ASRS) which maintains a temperature and relative humidity that makes it very hard for most pests to live in. For more information on the topic of pest management, please visit the Northeast Document Conservation Center website. So, even though you may not be able to eat your own slice of pizza while visiting RBSC, you can always access and take a whiff of Coupland’s pizza box—the musty pizza smell is sure to cure anyone’s persistent tummy grumbles. Question: What glitters and was once home to thousands of swarming insects? Answer: The contents of file 184-38 of the Douglas Coupland fonds at UBC’s Rare Books and Special Collections. This dazzling bejeweled hornet’s nest has presented us with a unique range of questions… so let’s take a brief tour of the archivist’s approach to this wonder of nature. Let’s face the most important question. Why is this hornet’s nest a part of the Douglas Coupland fonds in the first place? If you’re familiar with Coupland’s work you may recall his nest sculptures. This nest that now resides in UBC’s vault is not of his own making, but it does communicate his exploration and interest in these objects. But why is it bejeweled? We’ll leave that one to researchers to figure out! 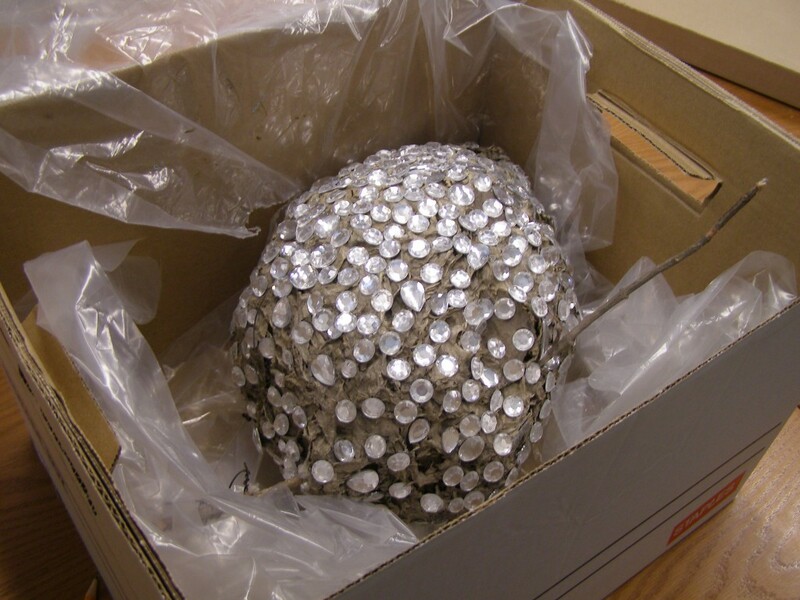 [Archivist’s note: Coupland also made an addition to his archives in 2010 which included wasp-nest paper in various stages of being “hand-chewed” by Coupland- this material resides in boxes 152 through 154 in the collection]. The idea of bringing an object that was created by insects and has been who-knows-where into the our sterile environment made us cringe (believe it or not, archivists aren’t huge fans of pests or dirt or mould or any other force of nature that likes to wreck paper). We did some research and learned a bit about the nature of the hornet beast along the way – check out this website for more info: http://www.ipm.iastate.edu/ipm/iiin/bhornets.html. Since the nest has been around for a few years, it turns out that it won’t be a danger to itself or its new archival neighbors. The fragile nest now resides in an acid-free cardboard box. We stabilized it within the box through the use of foam and tissue padding and archivally-approved bubble wrap. A reminder that Rare Books and Special Collections, University Archives and the Chung Collection will be closed on Monday August 6th for B.C. Day, along with all other branches of UBC Library. If you will be spending your long weekend watching the Olympic games, you might be interested to know that Rare Books and Special Collection holds the archives of former Olympian Harold Wright. He represented Canada in the 1932 Olympics in Los Angeles as a sprinter, reaching the semi-finals in the 100 and 200 m races. 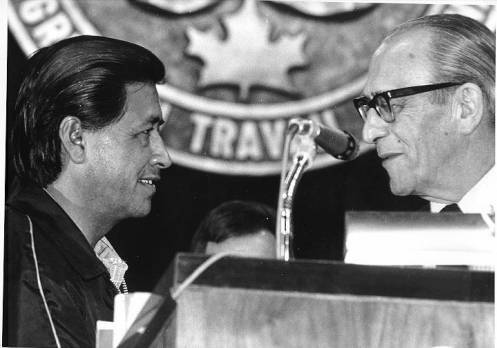 He went on to become the president of the Canadian Olympic Association, and would play a key role in bringing the summer Olympics to Montreal in 1976. Wright passed away in 1997, and was inducted into Canada’s Sports Hall of Fame in 1987. His archives contains a great deal of textual documents and ephemera related to sporting in B.C. and Canada, especially the Olympic games. There catalogue record for the collection is here; click on the inventory link for a detailed finding aid.